Here is the history and genealogy of our English, German, Norwegian and Finnish forebears who immigrated to North America at various times beginning almost 400 years ago. They or some of their descendants lived in Minnesota and Wisconsin in the first decades of the 20th century and link us to the past. This site is based on the work of many people. Foremost among them are: Maud Martin Latham, whose photo graces this page. Her work on the Martin and Hyde families first drew my interest to our family's history; Viktor O. Wilson, who compiled the histories of the Wilson and Ottman families; Ruth Simmons Stebbins, who compiled the Simmons family genealogy; Lottie Tanner Martin, who collected and preserved many photos and historical documents. 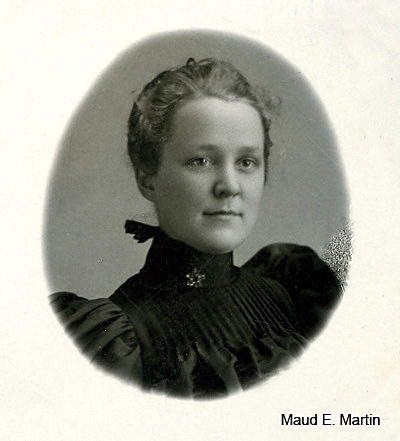 She was a founding member of the Morrison County (Minnesota) Historical Society and contributed a great deal of material to it; Fred and Ruth Martin who preserved and summarized much information and extended our knowledge of the Ottman family in New York. My goal is to make the information on this site as accurate as possible. Please see my page on Accuracy and Acknowledgements for more about this. If you have any questions or comments about the information on this site, please contact me. I look forward to hearing from you.